LAKELAND – The Florida Conference is taking registrations for United Methodists interested in bending the ears of state lawmakers on behalf of children in need. The annual trek to Tallahassee, known as Florida Advocacy Days, is slated for April 12-14, coinciding with Florida’s observance of Children’s Week in the capital. Participants will team up with representatives of the African Methodist Episcopal Church to receive a briefing on three key topics for legislation. They also will receive coaching in how to talk to legislators or legislative aides on those topics. Florida UMC Bishop Ken Carter, left, and Bishop Adam J. Richardson Jr. of the AME Church, 11th District, lead a contingent on the annual march to the Capitol Building in 2014. File photo by Rex Adams. Registration costs $60, which covers the cost of training materials as well as breakfast and lunch on Monday and Tuesday. Registration by Wednesday, April 8, is appreciated. Participants are responsible for securing their own lodging. For information and to register, click here. The event will begin Sunday, April 12. Participants are invited to participate in the 12:30 p.m. “Hanging of the Hands,” a Capitol Rotunda display of artwork from children across Florida that has become a tradition at the start of Children’s Week. • Reauthorizing federal child nutrition programs that include school breakfasts and lunches, summer food service and WIC, a supplemental nutrition program for women, infants and children younger than 5. The current law, the Healthy, Hunger-Free Kids Act, expires Sept. 20. • Expanding Florida KidCare to include children of legal immigrants. Currently, Florida requires a five-year waiting period for these children to be eligible for health insurance under the program. • Reducing juvenile arrests in the state by supporting Senate Bill 378. The bill would expand law enforcement discretion in issuing civil citations for misdemeanors, which would allow authorities to require community service or diversion programs instead of creating an arrest record. It also would make sure all eligible children across the state receive consideration for such programs. 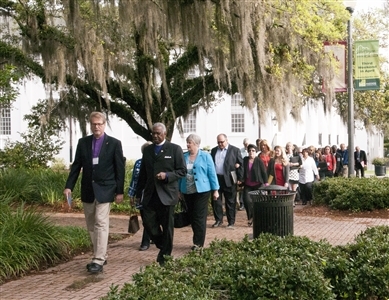 Participants also are asked to prepare for Florida Advocacy Days by reading “The New Jim Crow,” a book by Michelle Alexander that is available from Amazon and Cokesbury, among other booksellers. For additional information about Florida Advocacy Days, contact Pam Garrison in the Office of Missional Engagement, pgarrison@flumc.org. -- Susan Green is the managing editor of Florida Conference.